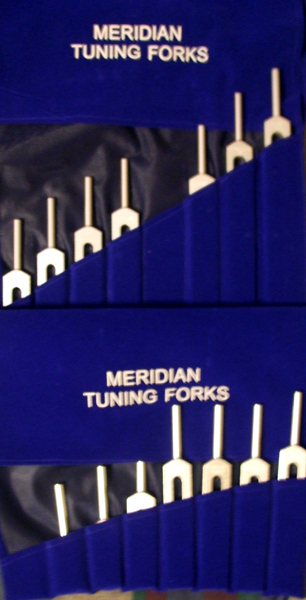 Use these tuning forks on the meridian system of the body. (please note that I have no way to prove or disprove the validity of these frequencies and the channels that they are associated with. I do, however, have some recent research papers about the meridian system and sound waves-see below). Unweighted set of 14 tuning forks. Cost is $199 plus $13.99 postage inside of the U.S. Call for pricing outside of the country. What is the Meridian System? Meridians are pathways, or channels, of energy that run through the human body. It is said that there are 12 major meridian channels in the body. Each meridian gives direction to the flow of energy. The energy flow is perceived as yin or yang. Each of the twelve main meridians corresponds to an organ of the body. Even though each meridian is named for an organ in the body, it is not the organ that is of particular interest, but the PROCESS of the energy flow through that organ and through the rest of the body. In this way, instead of concentrating on the flow of energy in one organ, we are concerned with the flow of energy throughout the entire person and the balance of that energy. When the flow of energy passes through the human body free and unhampered by blockages, there is a balance, a homeostasis that is formed. It is imbalances and blockages that may lead to physical, mental, and even spiritual problems in the body. If left untreated, these problems could become very serious and lead to the failure of the other systems in the body. This is why it is important to "catch" the small problems early on, before they become large problems and affect the rest of the body. Keeping your meridians unblocked and balanced will help to support your immune system. This in turn will help to enhance your ability to fight disease. In this state of balance, you will also be able to pick up the subtle early warning signs of an impending illness and be able to counteract its effects with preventative health care. Impending illnesses such as colds, flu, stress, headaches, etc. are all signs of a body that is being overstressed. Catching these and other symptoms in the early stages can save you from being the victim of a full blown attack. Sometimes, recognizing the early symptoms can help you to stop the impeding illness in its tracks, before it even has a change to take hold in your body. In a recent experiment (2015), first, a low electric impedance (LEI) current and then a vibration generator producing a 50 Hz sound wave was put on one set of the channels. It was discovered that each of these methods was able to produce nearly similar results. Results showed that the low impedance feature along meridians or at acupoints. W. S. Yang, investigated this phenomena and speculated on the pathophysiological functions of acupuncture meridians believing that the LEI runs within loose connective tissue by means of rich interstitial fluid (IF). The concept of a non-vessel flow of interstitial fluid (IF) was first introduced by Wei-Bo Zhang because no vessel-like structure was found along the meridians. Zhang based his findings on the Darcy’s law and conservation equation which states that the liquid cannot be compressed, that the inflow of liquid should equal the outflow. The volume of IF running through the channels can be measured using four electrodes and a constant current called bioelectric impedance analysis (BIA) technique. But what about using a tuning fork? Can using a tuning fork, instead of an electric current, create the same results? Well, according to this research paper, it sure can. According to this research, it was discovered that a tuning fork could create a good transmission of sound wave along the human meridians. For the purposes of this research, a vibration generator was put on one set of the channels and set to produce a constant 50 Hz sound wave. A crystal was placed on another set of meridians. It was discovered that the signal sent by the generator on one of the channels was picked up the crystal set on another channel. These results showed that the transmission from the sound waves traveled through the human body better along the channels than it did along non channels. Yang W. S. Investigation of the lower resistance meridian IV. Speculation on the pathophysiological functions of acupuncture meridians. Acta Scientiarum Naturalium Universitatis Pekinensis. 2008;44(2):281–288. Zhang, W. B., Wang, G. J., & Fuxe, K. (2015). Classic and Modern Meridian Studies: A Review of Low Hydraulic Resistance Channels along Meridians and Their Relevance for Therapeutic Effects in Traditional Chinese Medicine. Evidence-based complementary and alternative medicine : eCAM, 2015, 410979.